Since I was painting my steering wheel, and since the topic of steering wheel removal has come up many times, I thought I would take pictures and type up a DIY, so here it is. Before you attempt this project read through it once first. 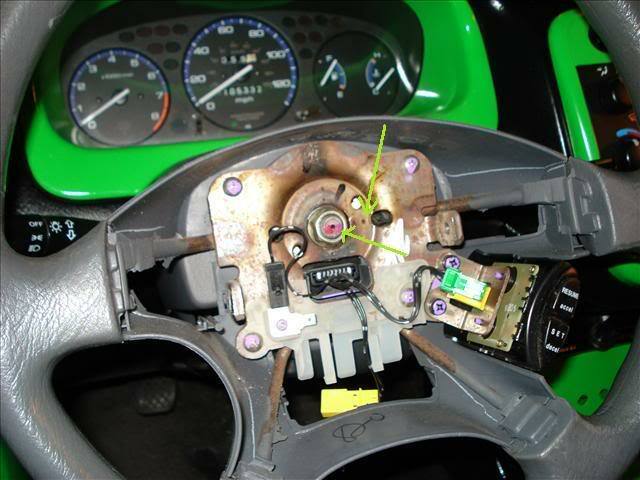 This tells steering wheel removal on a â€™99 (6th gen) civic, older models may be slightly different. 2) 19mm socket, and Â¼ hex socket. 5) Proper size socket(s) for your battery terminals. First of all, before you start make sure your wheels are straight ahead. Disconnect the negative side first and then the positive side. Then wait 3 minutes before continuing. Always be very careful when dealing with the airbag. You don't have to be afraid of it (for those who are then you shouldn't be driving), but you should respect it's power. Just handle it carefully and follow all of the steps. Note: When you are handling the airbag never face it directly toward you. On the bottom of the steering wheel there is a cover that pops off. 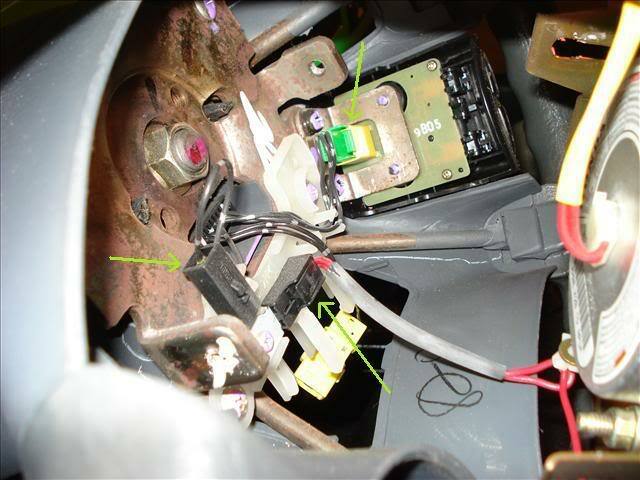 Inside is a yellow connector. 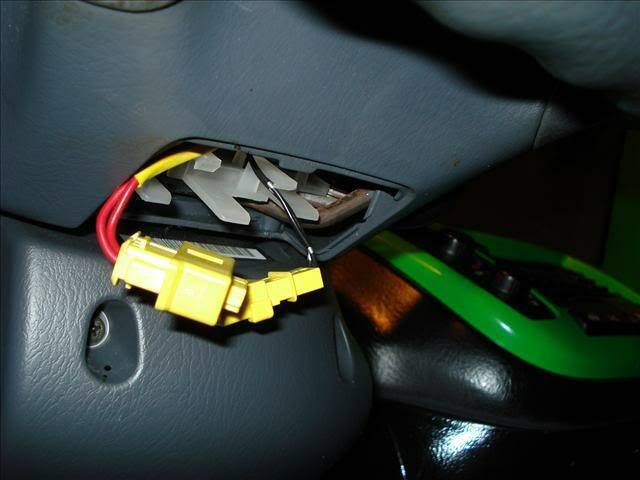 Disconnect the yellow connector, which will automatically short the airbag, preventing accidental deployment by electricity. 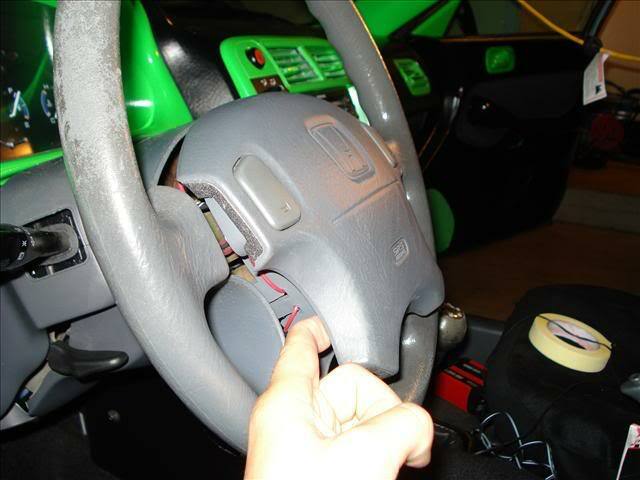 Next, pop off the panels on the left and right sides of the steering wheel and remove the 2 torx bolts. In order to remove the bolts on each side (since the factory torques them down tight) I used a rachet with the Â¼ socket and put the T30 bit inside that. Itâ€™s like a screwdriver/wrench. 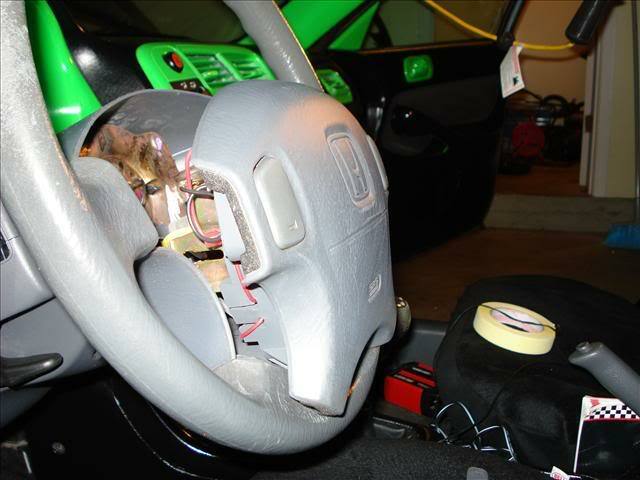 After you have removed both bolts, carefully pull the airbag out of the steering wheel a few inches. 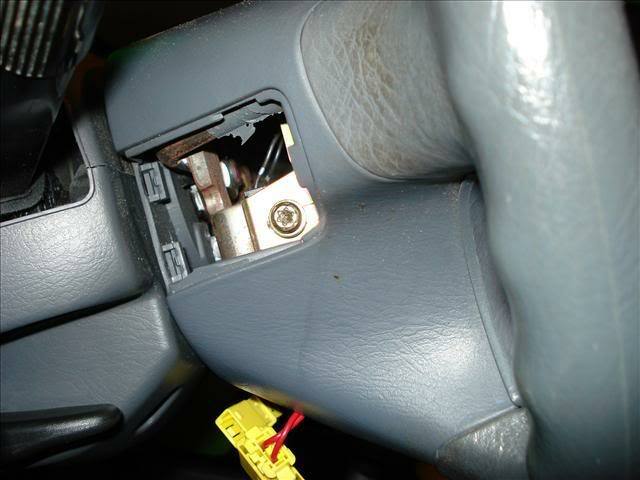 Remove other 2 connectors that connect the airbag to the steering wheel. (They are push to release, you might have to yank at them a little). 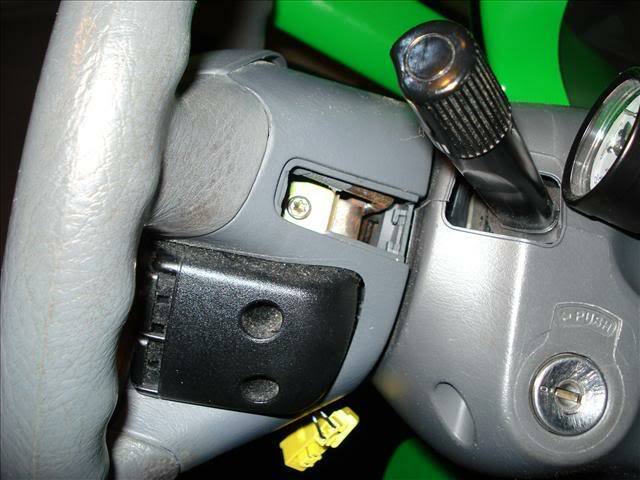 Then remove the cruise controls plug. Next using your breaker bar and 19mm socket remove the steering wheel bolt. Itâ€™s really tight so itâ€™s gonna take some elbow grease. It doesnâ€™t really need to be that tight since the splines hold the steering wheel to the shaft but I suppose when some guy is putting on so many steering wheels an hour he uses an impact wrench or something. 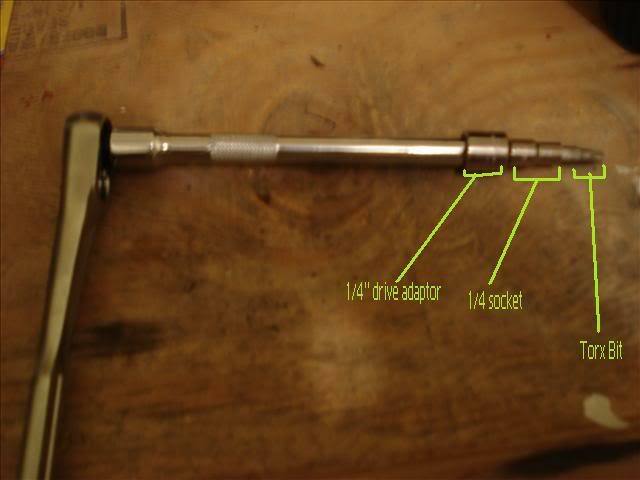 Now before you remove the steering wheel, take a sharpie and make a mark showing the relationship of the steering shaft to the steering wheel. There may already be one that they made in the factory. In the picture you can see the pink mark lines up with the dot on the right. This way when you put it back on it will be perfectly straight. Now you are ready to remove the steering wheel. Put one hand on each side and shake it back in forth (donâ€™t rotate it, shake it, back in forth, like in the direction of turning a bicycle or motorcycle) It will begin to loosen enough where you can finally pull it off. And there you go. Like Haynes says: "Installation is the reverse of removal." 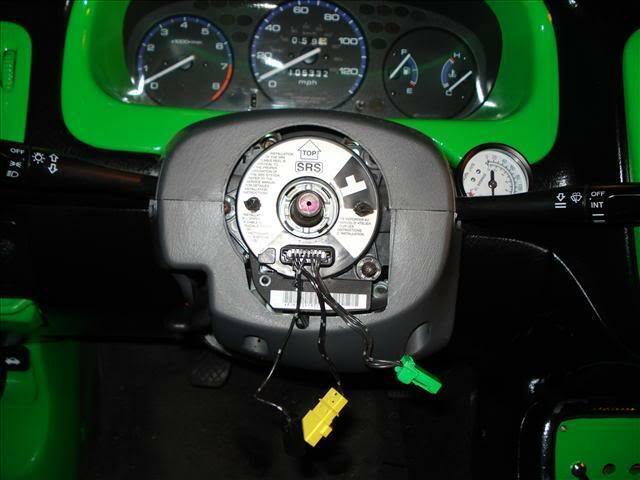 Very hard to turn steering wheel, nonpower steering. Power Steering Removal and Installation help?